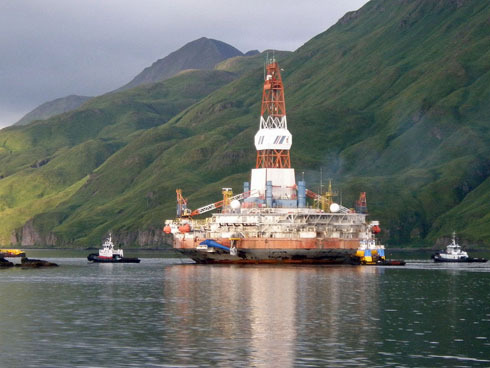 Big Oil in the Arctic Council? Drilling for oil is almost always risky business. Deposits are rarely found in convenient places and drilling is expensive. Even if alternative energies are slowly taking over the energy market, most experts agree that we still need oil. As current wells dry up, therefore, we must also drill in new, more challenging places, like the Arctic seas. The US Geological Survey estimates that the Arctic holds ninety billion barrels of undiscovered oil. This is almost three times annual global consumption and could be as much as thirteen percent of the world’s undiscovered reserves. The vast majority of Arctic oil, however, lies offshore – protected by fierce weather conditions that make drilling almost impossible, or at least very dangerous. Is NATO taking over the Arctic? Five of the eight Arctic Council states are NATO members. So far, 2012 has also been a year where Swedes and Fins have moved closer toward full membership of alliance. If Sweden and Finland were to join, which seems plausible, NATO members would occupy 7 out of the total 8 seats in the Arctic Council. US Coast Guard Cutter Willow and Her Danish Majesty’s Ship Hvidbjoernen navigate through icebergs off the coast of Newfoundland and Labrador, Canada, during joint Operation Nanook, Aug. 23, 2011. Photo: Charles McCain/flickr. In 2013 the Canadian government will hold the chairmanship of the Arctic Council. In preparation for this the Munk-Gordon Arctic Security Program last week released a set of recommendations of what should guide the Canadians’ two year tenure. Expectations are that the chairmanship will prove an assertive Canada acting on their belief that they promote the interests of the Arctic by advancing Canadian leadership. When we think of Chinese foreign policy most of us picture foreign direct investment in Africa and assertiveness in the Near Seas (Yellow, East China and South China). Few of us think ice breakers. China’s application to join the Arctic Council as permanent observer however suggests the Chinese are now looking north. Arctic: What Place for Scandinavian Solidarity? 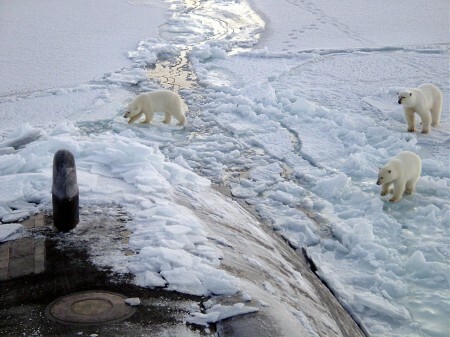 "This is our territory:" Polar bears on the starboard bow of a submarine. Picture: Wikipedia Commons. It has been an exciting New Year for High North policy in the Scandinavian countries. In the annual Foreign Policy Declaration last Tuesday, Sweden’s Foreign Minister Carl Bildt reiterated the government’s intent to push its new Arctic Strategy as one of its core foreign policies. To the west, Norwegian Foreign Minister Jonas Garh Störe announced Oslo’s new project of drilling for petroleum (together with Russia) in the northern parts of the Barents Sea. In the south, Denmark’s Foreign Minister Villy Søvndal appointed the country’s first Arctic Ambassador, Klavs A. Holm, previously an emissary to London, Singapore and the EU. The Arctic is the new buzz word in Scandinavian corridors of power. All three states have now drawn up comprehensive strategies articulating their vision for the region. But are their visions compatible? While Scandinavian states are often considered politically indistinguishable (and have pledged themselves, as signatories of the “Nordic Declaration of Solidarity,” to govern in respect of their common heritage) their geographical differences could bring them into competition over the Arctic.